Our range of services include twin wire arc spray coating and thermal spray coating. 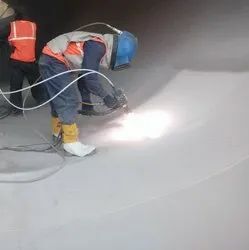 We have been in the field of Thermal Spray since 2009 and have successfully been completed Thermal Spray Coating work for Nuclear Power Plant, Thermal Power Plant, Wind Power Plant, Hydro Power Plant, Cement Plant, Paper industries, Oil and Gas Refineries, Offshore Platforms and many more. We do all types of Ferrous and non-ferrous coating. We carry out coating of different material i.e. Aluminium, Zinc, S.S., Copper, Brass, Bronze, Silver, Tungsten Carbide etc. We also do coating on Boiler tubes. Till now we have successfully worked with PDO, KNPC, EIL, Linde, Exxon Mobil, Petrobras, Petrofac and many more with their respective specifications.